Let me tell you about Dominique (and for those of you I speak with on a regular basis, this is probably the 10th time you’ve heard me rave about her). She is a tutor who works primarily with children and I met the first week we arrived. I was a concerned about the boys getting situated as we were strangers in a strange land, so Tim found out about Dominique on a previous trip to here and I contacted her as soon as we landed for good. She used to be a teacher at the international school in our town, but she recently retired from that gig to work with kids learning French in after school workshops and vacation camps. Although O & E’s first reaction to having to see a French tutor was one of whining and complaining, only moments after meeting her they were pushing me out the door and telling me to leave so they could start learning French. She’s that good. Part of the reason the kids love her so much, in addition to the fact that she is warm and thoughtful, is that she loves to cook with them. It’s kind of funny because before we moved to France, I had the impression that most French people were very good cooks – all you ever hear about is Julia Child, French bakeries, the Sorbonne, etc. However, since we’ve come here, I have yet to meet a French person who cooks at all, let alone someone who is good at it. Dominique is different in this regard. She’s not a fancy cook, but she finds typical French things to cook with the kids each week while teaching them French – and the kids love her for it. Tim & I are usually the side beneficiaries of her weekly cooking sessions because each week the kids seem to leave with either dinner for us or a very tasty French dessert. A few weeks ago, I went to pick the boys up after their weekly tutoring session and Dominique told me they had made something really special for dinner. That day, it wasn’t something French that they had cooked, but rather an “American hamburger.” Dominique bought a kid’s cookbook and found the recipe for making a typical American burger (complete with onions in the burger meat) and the kids proceeded to make it as pictured in the cookbook. They were so proud of their burgers which had not only real burger buns (very hard to find in France), but also American cheese and bacon. Dominique is magic. 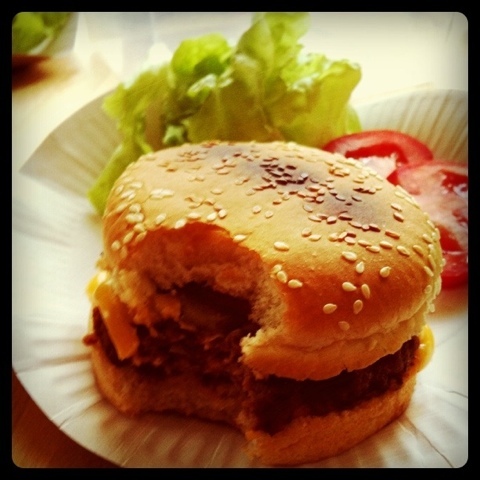 This entry was posted in food/drink and tagged cooking, food, France, hamburger. Bookmark the permalink.